Stress could interfere with your senior parent’s ability to live a normal life as he or she ages. When stress isn’t controlled, it can increase the risk of a stroke, heart attack, diabetes, a poor immune system, depression, and more. To help your loved one manage stress, here are some tips to consider. One of the top causes of stress is isolation. When seniors are bored and lonely, they often experience high levels of anxiety that lead to depression. However, pets provide a sense of companionship that can reduce stress levels and boost confidence. Your loved one can pet sit for family and friends if he or she doesn’t want to take on the responsibility of being a full-time pet owner. He or she can also volunteer at the local animal shelter a few times each month. Being in tune with his or her body can help your loved one find a sense of calm and peace. When meditating, your loved one can also manage the symptoms of various diseases, which could lower stress. Seniors should try meditating a few minutes each day, even if it’s only a five-minute breathing exercise. 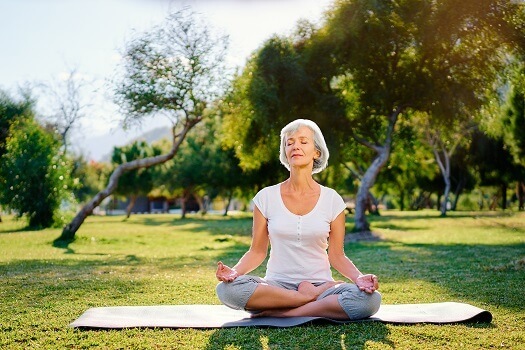 Meditation relaxes the muscles and specific areas of the brain that control how seniors feel and think. As a result, they can remain calm and positive instead of being stressed and sad. Caregivers need stress relief, too, so meditating can be a great idea for the whole family. Family caregivers sometimes need a break from their caregiving responsibilities. When they need respite care, Winnipeg families can rely on professional caregivers to help their senior loved ones remain safe at home. Seniors need to be mindful of the foods they eat, such as saturated fats and sugars. These foods can trigger stress hormone levels in the body, increasing the risk of depression. In contrast, there are certain foods aging adults can eat to fight against stress naturally, such as asparagus, blueberries, salmon, nuts, oatmeal, spinach, kale, and dark chocolate. Aging adults who follow a healthy diet can manage their stress levels better. Adrenaline and cortisol are two of the top stress hormones that impact a senior’s health. Exercising is one of the best ways to lower the levels of these hormones. Your parent should maintain an active life that includes daily or weekly workouts, such as walking, dancing, and doing strengthening exercises. When seniors exercise, the activities stimulate their bodies and lead to the production of natural mood-boosting endorphins that combat stress. For seniors with mobility issues or health conditions that make it difficult to exercise on their own, a professional caregiver can be a wonderful asset. There are a variety of age-related health conditions that can make it more challenging for seniors to live independently. However, many of the challenges they face can be easier to manage if their families opt for professional in-home care. Winnipeg families can rely on expertly trained caregivers to keep their loved ones safe and comfortable while aging in place. Instead of worrying about a situation, encourage your loved one to find a way to overcome the obstacles that stand in his or her way. For instance, if your parent can no longer drive, help him or her download senior-friendly transportation apps. You can also look for free transportation resources within the community. If your loved one has been diagnosed with a chronic condition, motivate him or her to live every day to the fullest by finding fun, accessible activities to do. Explain how staying physically and mentally active could slow the progression of the disease and boost his or her overall health. Stress can have a number of unhealthy physical and emotional effects on seniors, so lowering stress levels is an important part of boosting their overall wellbeing. In Winnipeg, senior home care agencies can be a great boon to seniors. With the help of the caregivers at Home Care Assistance, your aging loved one can lead a happier and healthier life. We offer a revolutionary program called the Balanced Care Method, which encourages seniors to eat nutritious foods, exercise and socialize regularly, and focus on other lifestyle factors that increase life expectancy. If you need compassionate, professional care for your loved one, call one of our friendly Care Managers today at (204) 489 6000.